Welcome to Journal System Portal University of Merdeka Malang (UNMERJSP), UNMERJSP is a journal management and publishing system, development of both Regional and National journals owned by University of Merdeka Malang. JASIEK adalah jurnal Open-Access yang dikelola oleh Jurusan Teknik Elektro, Fakultas Teknik, Universitas Merdeka Malang, Indonesia. Teknologi berkembang dan diperbarui dengan cepat. Dengan demikian distribusi dan publikasi yang cepat kepada para mahasiswa dan umum sangat penting. Setelah kami menerima naskah jurnal kemudian proses pengeditan yang diperlukan untuk lebih cepat menerbitkan naskah jurnal yang diterima. Penerbitan secara berkala 2 (dua) kali setahun. Beberapa perubahan lain dalam JASIEK diinformasikan pada catatan jurnal. JURNAL BISNIS DAN PERPAJAKAN (JURNAL BIJAK) adalah jurnal yang dipublikasikan oleh D3 Akuntansi, Fakultas Ekonomi dan Bisnis, Universitas Merdeka Malang. Jurnal ini berfokus pada bidang akuntansi keuangan, perpajakan, akuntansi manajemen, auditing, kewirausahaan serta bisnis dan manajemen. Topik jurnal Bijak akan dipublikasikan 2 kali dalam 1 tahun (Februari dan Juli). Jurnal bIjak menerima artikel yang disusun oleh organisasi profesi, pusat penelitian, serta hasil seminar dan konferensi. Google Scholar , Garba Rujukan Digital (GARUDA). Following the end of Millennium Development Goals (MDGs) in 2015 with 8 goals, United Nation (UN) develops the sustainability of the world's goals through Sustainable Development Goals (SDGs) with 17 goals. As well as other countries in the world, the Indonesian government is also working towards achieving these objectives in the government, business and civil society sectors to co-operate with the UN and the Indonesian government started mobilizing to achieve the Sustainable Development Agenda by 2030. Universal, inclusive and indivisible, the Agenda calls for action by all countries to improve the lives of people everywhere. Graduate School of University of Merdeka Malang as an educational institution takes a role in a small part in the academic field by conducting scientific discussions from scholars and practitioners in a conference forum. This activity adopted Agenda 2030 for Sustainable Development and 17 Goals for Sustainable Development. The ultimate goal of this conference is to answer the needs and thinking of the people in Indonesia and international people to achieve sustainable living and also to know more about the efforts of the UN and its partners to build a better world without being left behind. 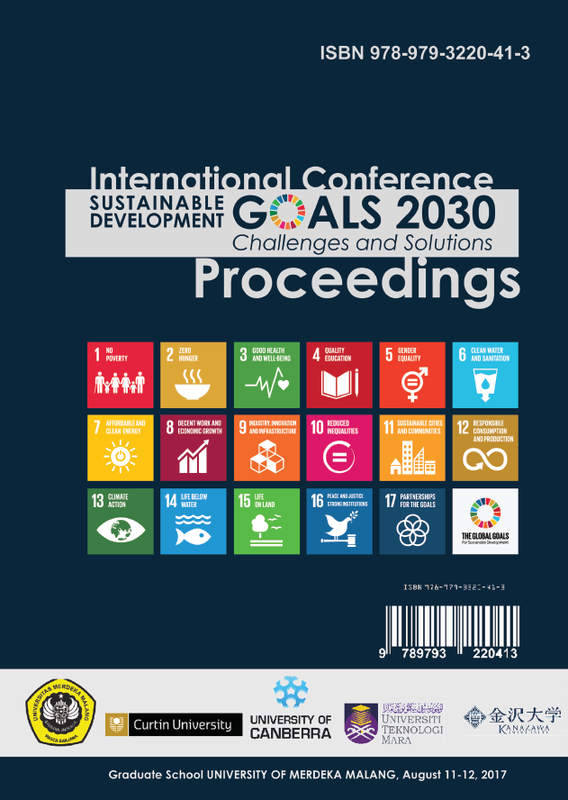 The conference, entitled "SUSTAINABLE DEVELOPMENT GOALS 2030: CHALLENGES AND ITS SOLUTIONS" is expected to be gathered by field ideas and practices on the implementation of SDGs in the world. A collection of articles will greatly assist the Indonesian government in particular and other countries in the world in providing alternative solutions and challenges for sustainability in the future. AFRE (Accounting and Financial Review), is a publication of Graduate School Program, University of Merdeka Malang. The journal is an article published continuously which is intended not only as a place to share ideas, study, and analysis but also as an information channel to improve and develop accounting and finance science. This publication consists of scientific writings in the form of research finding, analysis, and application theory, conceptual idea, new book review, bibliography, practical writing from experts, academics, and practitioners. The published writings have been in the process of editing needed by the publisher without changing the substance as the original script. The writing in each publication is the personal responsibility of the author and it does not reflect the publisher’s idea. More several other changes in AFRe are informed in the Journal History. Editor-in-Chief : Irany Windhyastiti SE, MM. Managing Editor : Umu Khouroh SE, MSi. 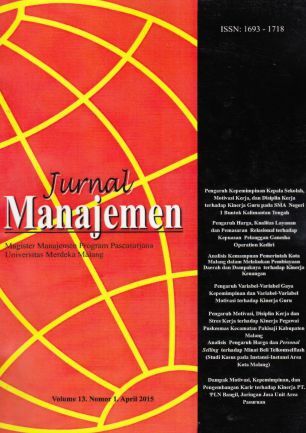 Jurnal Manajemen dan Kewirausahaan is a periodical issue containing information and analysis related to management science and entrepreneurship. This journal is of a popular scientific nature that includes both theoretical and empirical research. More several other changes in JMDK are informed in the Journal History. LOCAL WISDOM is a scientific journal in the field of Architecture and the City as a "bridge" between the disciplines of architecture and urban planning and design studies.This scientific journal focusing on research relating to the study of local wisdom. Local knowledge is a potential local characteristic based on a local culture that has been a tradition in public life. A form of local wisdom studies varied widely, ranging from a cultural value system, social system to the physical manifestation of culture in the form of local knowledge, local technologies, as well as the physical form of the built environment. Studies of local wisdom is an effort in order to realize the harmony of the city environment, and sustainable through the use and development of local knowledge, contextual and a participatory approach. The scope of the study will be published in an article relating to the study of architecture (space, shape, and arrangement), a special area of study, and the study of urban planning and design. Local Wisdom of Journal published by the Center for Local Wisdom Studies, Department of Architecture, University of Merdeka Malang. More several other changes in LOCAL WISDOM are informed in the Journal History . EnJourMe (English Journal of Merdeka) : Culture, Language, and Teaching of English is peer-reviewed journal. Funded in 2016 with registered number ISSN: 2502-5740 (online), provides a forum for the full range of scholarly articles in the field of Culture, Language, and Teaching of English. It is published by Universitas Merdeka Malang. The contents of the journal include analyses, studies, application of theories, research reports, materials development, and reviews. EnJourMe is published twice in a year in the month of July and December. This journal has been indexed in Google Scholar and DOAJ. In citing the refferences, it is recommended for using citation tools. The manuscripts submitted into EnJourMe will be screened for plagiarism with plagiarism checker tool. Several other changes in EnJourMe are informed in the Journal History. Jurnal Nomosleca merupakan jurnal komunikasi yang membahas karya hasil penelitian dan pemikiran konseptual di bidang komunikasi. Artikel yang dimuat dalam jurnal komunikasi nomosleca memiliki kajian di bidang komunikasi dan multi disiplin ilmu lainnya yang berkaitan dengan ilmu komunikasi. Jurnal komunikasi ini terbit dua kali setiap tahun pada bulan April dan Oktober. Jurnal Research Ekonomi Bisnis, Jurnal Ilmiah yang diterbitkan berkala oleh Program Doktor Ilmu Ekonomi Universitas Merdeka Malang, ISSN Print 2089-6077 Tanggal 05/01/2012, SK no. 0005.049/JI.3.2/SK.ISSN/2012.01 - 11 Januari 2012 (mulai volume 1 nomor 1 April 2012). More several other changes in Jurnal Reaserch Ekonomi Bisnis are informed in the Journal History. 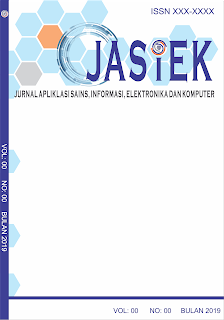 JEEMECS is an Open-Access journal who managed by Electrical Engineering Department, Faculty of Engineering, Universitas Merdeka Malang, Indonesia. The technologies are rapidly changing and updating. Thus rapid distribution and publication to researchers, engineers, and educators are very important. Our aim after receiving the manuscript and editing process required is to quickly publish the received letters. Publishing periodically 2 (two) times a year. More several other changes in JEEMECS are informed in the journal history. Abbreviation : J. Cakrawala Huk. Jurnal Cakrawala Hukum Indonesia (Indonesia Journal of Cakrawala Hukum/ IDJCH), is a scientific periodical of the Faculty of Law, University of Merdeka Malang, which includes a variety of research in the field of law, or the analysis of actual case studies, or ideas related to the actual law. A Scientific periodical is intended as a means of scientific communication and a means of fostering, developing and strengthening knowledge in the field of law. Academics, legal practitioners, or anyone interested in the field of law may submit his papers to the editor with the guidelines in writing. Coverage includes, but is not limited to Employment and industrial law, Corporate governance and social responsibility, Intellectual property, Corporate law and finance, Insolvency, Commercial law and consumer protection, Environmental law, Taxation, Competition law, and Regulatory theory. Researchers in all law fields are encouraged to contribute articles based on recent research. More several other changes in IDJCH are informed in the Journal History. Jurnal Teknologi dan Manajemen Informatika (JTMI) diterbitkan oleh Fakultas Teknologi Informasi Universitas Merdeka Malang. JTMI terbit 2 edisi per tahun pada Januari - Juni dan Juli - Desember dengan scope ilmu komputer yang mencakup teknologi informasi, sistem informasi, dan manajemen informatika. Saat ini telah terbit dengan Vol 1 No 1 Tahun 2016, Vol.2 No. 1 Tahun 2016, Vol.3 No.1 Tahun 2017, dan Vol.3 No.2 Tahun 2017. Informasi lebih lanjut hubungi kontak: http://jurnal.unmer.ac.id/index.php/jtmi/about/contact. Abbreviation : J. Pariwisata Pesona. Jurnal Pariwisata Pesona (JPP), is a scientific periodical journal of Diploma of Tourism, University of Merdeka Malang, which includes a variety of research in the field of tourism and hospitality, the analysis of actual case studies, or ideas related to the actual tourism and hospitality studies. This scientific periodical journal is intended as a means of scientific communication and a means of fostering, developing and strengthening knowledge in the field of tourism. Academics, legal practitioners, or anyone interested in the field of tourism and hospitality may submit their papers to the editor with the guidelines in writing. Researchers in all tourism and hospitality fields are encouraged to contribute articles based on recent research. Open Journal Systems (OJS): Open Journal Systems (OJS) has been applied for all business process in Jurnal Pariwisata Pesona (JPP) including submitting – reviewing – editing – publishing since 2016. Therefore, the authors are required to register and upload the manuscript by ONLINE SUBMISSIONS in advance. The process of the manuscript could be monitored through OJS. Authors, readers, editorial board, editors, and peer review could obtain the real-time status of the manuscript. Starting Volume 18 No. 2 December 2017, Jurnal Pariwisata Pesona (JPP) had a New Cover for a printed version. Directory of Open Access Journal (DOAJ), SINTA, Portal Garuda, Google Scholar, Mendeley, Turnitin. PUBLISIA: Jurnal Ilmu Administrasi Publik, with registered number ISSN 2541-2515 (print), ISSN 2541-2035 (online) is a multidisciplinary scientific journal published by University of Merdeka Malang (Unmer Malang). The scope of this journal concerns many problems in general or problems related to the science of public administration at the developing national level. The purpose of this journal publication is to disseminate conceptual thinking or ideas and results of research that have been achieved in the fields of public administration, public policy, and governance. Especially focused on issues in the development of public policy science and local governance. Broader coverage is administrative development, regional autonomy and bureaucracy, state apparatus, decentralization, development economics, public management, and social sciences which include public health, fiscal politics, and regional planning. Please read these guidelines carefully. Authors who want to submit their office manuscript to the editorial office of PUBLISIA: Jurnal Ilmu Administrasi Publik should obey the writing guidelines. If the text is not written in a different format, it will BE REJECTED by the editors before further reviewed. The editor will only accept the manuscripts which meet the assigned format. Merdeka Journal of Law, Merupakan terbitan berkala ilmiah dari fakultas hukum unmer malang memuat berbagai hasil penelitian,dibidang hukum, analisa atau studi kasus aktualataupun gagasan-gagasan aktual terkait dengan hukum berskala ilmiah, ini bertujuan sebagai sarana komunikasi ilmiah dan sarana pembinaan pengembangan serta penguatan pengetahuan di bidang hukum. Journal History. Jurnal Bisnis dan Manajemen covers the areas of financial management science, human resource management, marketing management, and strategic management It also covers the field of entrepreneurship. Editor-in-Chief : Dr. Ir. Junianto HW, MT. Managing Editor : Dr. Dina Poerwoningsih, ST., MT. Mintakat: Jurnal Arsitektur (JAM) dalam versi jurnal online yang terbit di tahun 2017 ini sebenarnya adalah format baru dari penerbitan offline sejak tahun 2000. Jurnal ini diterbitkan oleh oleh Group Konservasi Arsitektur & Kota, Jurusan Arsitektur, Fakultas Teknik Universitas Merdeka Malang. Dalam format online JAM merencanakan akan terbit 2 (dua) kali dalam setiap volume pada bulan Maret dan September. Dimaksudkan sebagai media informasi dan forum kajian masalah arsitektur berupa karya tulis ilmiah yang diangkat dari hasil penelitian, review jurnal maupun gagasan kritis yang orisinil. Lingkup keluasan dan kedalaman arsitektur tulisan dalam setiap penerbitan jurnal tidak dibatasi. Namun demikian Redaksi memandang perlu untuk sesekali menetapkan tema dan topik tertentu dalam edisi penerbitannya. Redaksi mengundang para ahli, praktisi dan siapa saja yang berminat untuk menyumbang tulisan, yang belum pernah diterbitkan dalam media cetak lain. Abbreviation : J. Keuang. dan Perbank. Jurnal Keuangan dan Perbankan (Journal of Finance and Banking), publishes theoretical and empirical research across all the major fields of financial and banking research. It serves as a forum for all the academicians, research scholars, scientists, and also for the industry people to share their finance and banking views and to publish their scholarly papers. The aim of the Journal of Finance and Banking is to provide an outlet for the increasing flow of scholarly research concerning financial institutions and the money and capital markets within which they function. Journal of Finance and Banking welcomes submissions of complete and original research manuscripts, which are not under review in any other conferences or journals. The journal is the official publication of Finance and Banking Program University of Merdeka Malang, the institution devoted to the study and promotion of knowledge about finance and banking. Editor-in-Chief : Ir. I Made Sunada, MSc. Jurnal TRANSMISI dipublikasikan oleh Jurusan Teknik Mesin Universitas Merdeka Malang sebagai media diseminasi hasil penelitian dan karya ilmiah baik penelitian dasar maupun terapan di bidang teknik mesin. Berkala ilmiah ini memuat naskah dengan bidang kompetensi konversi energi, material (metalurgi), produksi dan manufaktur baik merupakan penelitian dasar ataupun rekayasa alat terapan. Beberapa perubahan dalam Jurnal TRANSMISI diinformasikan di journal history.